Award winning LED Lenser Lights are the most technologically advanced flashlights available. In order to better understand the difference between solvent and “nonsolvent”, or aqueous-based, hand cleaners, it is important to have a rudimentary understanding of the underlying chemical principles of each. In it’s simpliest form, a solvent is a substance that is able to dissolve another substance, whereas the solute is the substance being dissolved. When solvents and solutes of the same kind are mixed together and distributed evenly you get a solution; the keyword here being ‘same‘. In chemistry, molecules are distinguished as polar or non-polar depending on their electrical or magnetic properties. Polar molecules attract other polar molecules and repel the non-polar ones. Technically, water is a solvent because virtually anything can be dissolved in it. However, due to it’s positive and negative charge, water is classified as a polar molecule. On the other hand, oil is not. As a general rule, polar solvents dissolve polar solutes, and nonpolar solvents dissolve nonpolar solutes. These two substances are chemically divergent and cannot absorb each other’s molecules. What does all of this mean and what does it have to do with industrial hand cleaners you may ask? Well, the simple answer is that it has everything to do with industrial cleaners and why manufacturers have long since depended on the use of nonpolar solvents such as benzene and tetrachloroethylene to effectively remove heavy-duty contaminants such as oil and grease from hands. Such “organic” solvents, as considered by the general population, are excellent at breaking down and dissolving contaminants like oil in the cleaning solution, something that water cannot do well. However, use of these solvents over time has not been without consequence. Increasing concern over workers’ health, ozone depletion, air pollution, and safe disposal of such substances have ignited efforts to find alternatives to conventional cleaning solvents in the form of aqueous, or ‘nonsolvent’ cleaners. Aqueous Cleaners rely on a blend of ingredients designed to enhance the cleaning ability of water. Known as surfactants, these additives may act as detergents, wetting agents, emulsifiers, foaming agents and dispersants, reducing the surface tension of a liquid in which it is dissolved. Surfactants help water get “wetter” lifting dirt and oil away from the skin’s surface and surrounding it with water so that it can be washed away. 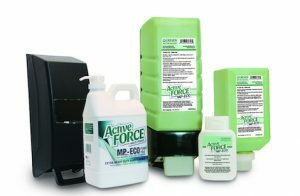 Traditionally, water-based detergents have been viewed as a less effective solution to their solvent-based counterparts, but the development of products such as Greven Active Force MP, MP-ECO, and Blue Wash are quickly putting this theory to the test. In addition to being safe for workers, these ‘nonsolvent’ cleaners are biodegradable, contain no crude odors, and perform as well, if not better, than their competition proving that indeed social responsibility and effectiveness can go hand in hand. New standards put forth by the Occupational Safety and Health Administration (OSHA) are underway and will soon help provide better protection for workers exposed to crystalline silica in construction, maritime and general industry. Crystalline Silica, a common mineral identified in the earth’s crust, can be found in a variety of materials including concrete, sand, stone and mortar. When broken down into very small particles through cutting, sawing, sanding, grinding, or drilling, crystalline silica can pose a very serious health threat to workers who inhale this dust. As it is known, respirable crystalline silica puts workers who inhale these microscopic particles at an increased risk for developing serious silica-related diseases including lung cancer, chronic obstructive pulmonary disease, kidney disease and silicosis, an incurable lung disease that may lead to disability or death. It is estimated that approximately 2.3 million people in the U.S. are exposed to silica at work. By reducing the Permissible Exposure Limit (PEL) to 50 micrograms of respirable crystalline silica per cubic meter of air, OSHA hopes to save over 600 lives and prevent more than 900 new cases of silicosis each year. Averaged over an 8 hour day, the new PEL is half the previous limit for maritime and general industry and five times lower than the previous limit for construction. Under these new rules, the air employees breathe must be regularly sampled and analyzed to ensure that exposure levels do not exceed these limits. However, employers in the construction industry who are fully and properly implementing the engineering controls, work practices, and respiratory protections as specified by OSHA in Table 1 (a flexible compliance option for the construction industry), are not required to comply with the air sample measurement requirements as noted above. In addition to the lower PEL levels and air sample provisions detailed in these new OSHA regulations, the new standards require both general industry and maritime employers to have a written exposure control plan in place as well as engineering and work practice control procedures. Implementing engineering controls and safe work practices: Effective engineering controls as described include wetting down work operations, process isolation, or using local exhaust ventilation (such as vacuums) to keep silica-containing dust out of the air and out of workers’ lungs. HEPA-filtered vacuuming is an example of a housekeeping method that minimizes employee exposure to respirable crystalline silica. These filters are at least 99.97% efficient in removing mono-dispersed particles of 0.3 micrometers in diameter. Respiratory protection may only be used when engineering controls are insufficient at reducing PEL levels. Regulated Area Designation – Employers must designate high-exposure areas where PEL levels may be above the allowable limits. Education and Training – Employees must be educated and trained on operational hazards and proper work practices to minimize silica dust exposure. Medical Examinations – Workers exposed to over 25 micrograms per cubic meter, for 30 days each year, must be provided medical surveillance to help identify adverse health effects associated with respirable crystalline silica exposure and take appropriate action when needed. The roll-out of these new standards will occur over a 4 year time period which began on September 23, 2017 for operations in the construction industry. Subsequently, the following compliance dates should be noted and every effort should be made to ensure that appropriate measures are in place to comply with these regulations by the dates listed below. September 23, 2017: Employers are expected to comply with all obligations of the standard (except methods of sample analysis). June 23, 2018: Employers are required to comply with methods of sample analysis. June 23, 2018: Employers are required to comply with all obligations of the standard, with the exception of the action level trigger for medical surveillance. June 23, 2018: Employers are required to offer medical examinations to employees exposed above the PEL for 30 or more days a year. June 23, 2020: Employers are required to offer medical examinations to employees exposed at or above the action level for 30 or more days a year. June 23, 2018: Employers are required to comply with all obligations of the standard, except for engineering controls and the action level trigger for medical surveillance. June 23, 2018: Employers are required to offer medical examinations to employees exposed above the PEL for 30 or more days. June 23, 2021: Employers are required to comply with requirements for engineering controls to limit exposures to the new PEL. *June 23, 2018 – June 23, 2021*: Employers can continue to have employees wear respirators if their exposures exceed the PEL. For additional resources and compliance assistance, please visit OSHA’s Crystalline Silica Rulemaking page. On-site consultation is available at no charge to small and mid-sized businesses interested in getting a jump-start on these standards. The National Association of Lubricating Grease Manufacturers, Inc. (NLGI) is a not-for-profit association composed of companies who primarily manufacture and market various types of lubricating grease. The objectives of the NLGI are to disseminate information that can lead to the development of better lubricating greases for the consumer and to provide better grease lubrication engineering service to the industry. The NLGI consistency number expresses a measure of the relative hardness of a grease used for lubrication, but is only one factor in determining suitability of a grease to a specific application. The consistency of grease (its ability to resist deformation by an applied force) is controlled by the thickener concentration, thickener type and the viscosity of the base oil. NLGI’s classification defines nine grades, as shown below; each correlated to a range of ASTM worked penetration values, measured using two test apparatus. The first apparatus consists of a closed container and piston-like plunger that is perforated to allow grease to flow from one side to the other as the plunger is moved up and down. The test grease, with a constant temperature of 25 degrees Celsius, is inserted into the container and stroked 60 times before being moved to a penetration test apparatus. This apparatus consists of a container, specially configured cone and dial indicator that, once filled, is smoothed over. With the cone’s tip touching the grease’s surface and the dial indicator set to zero, the test begins. Over a specified period of time, the weight of the cone will cause it to penetrate the grease, after which time, the depth of penetration is measured. High consistency greases, as indicated by higher NLGI numbers, are recommended for use in high ambient or operating temperatures when bleeds or leaks are of concern. These greases are firmer and tend to stay in place and may be used on high-speed ball/roller bearings, with low-viscosity base oil, or on low-speed journal bearings. Lubricants with a lower consistency, or NLGI number, are suggested for cold temperature operations on low-speed rolling element bearings, with high viscosity. A common mistake when selecting a grease is to confuse the grease consistency with the base oil viscosity. It’s important to remember that that both speed and load help determine the appropriate viscosity required for application. Even though base oil viscosity affects consistency, it is possible for a grease to have a high consistency and low base oil viscosity or vice versa. 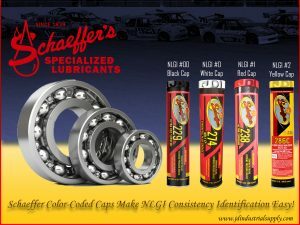 Companies, such as Schaeffer Oil are helping make NLGI consistency identification simple through the use of color-coded caps on their high-temperature, waterproof, synthetic and high- pressure greases. Available in a variety of grades to suite the unique application requirements of its users, Schaeffer Lubricants feature black, white, red, yellow and clear tops that correlate directly to NLGI consistency numbers. Understanding these differences and knowing which cap to look for, will help make choosing the right grease look easy. With global population growth expected to reach an estimated 9.7 billion by 2050, how worldwide food production may be augmented to meet the needs of an expanding international community continues to be a hot topic of discussion among agricultural field experts. The process of identifying alternative methods for plant production that are adequate and economically viable, without significantly raising public food costs, is an ongoing challenge for today’s farmers. To date, the use of pesticides has remained the predominant method for preserving and ensuring the evolution of the world’s food supply due to their overall effectiveness and affordability. However, despite the success of a wide range of pesticides that include insecticides, herbicides and fungicides, plants still exhibit many natural barriers that directly affect the retention, entry and transport of these substances. The main barrier to pesticide movement into the plant is a waxy layer, called the cuticle, which covers the entire plant surface and serves to prevent water loss. As a result, pesticides applied to the leaves of plants generally face greater obstacles than those applied to soil. In an effort to combat these barriers, specialized additives, referred to as surfactants, may be added to spray solutions to improve the emulsifying, spreading, sticking and absorbing properties of liquids. Pesticides formulated or applied with surfactants reduce surface tension within the external surface layers of water and allow for more effective movement of the pesticide through the cuticle. Surfactants (aka: surface-active agents) can be classified into 4 primary classes including non-ionic, anionic, cationic and amphoteric that differ according to the electrical charge on the hydrophilic (“water-loving”) end of the molecule. As a general rule, non-ionic surfactants are the safest to use and the most versatile, accounting for nearly 50% of surfactant production. Due to their lack of an electrical charge, non-ionic surfactants can be used with any product because there are no positive or negative ions to react with the active chemical with which they are being mixed. By reducing the surface tension of the spray solution, surfactants flatten the water droplets, thus spreading the pesticide on the leaf surface. This allows more surface area for the chemical to come in contact with the leaf, allowing chemicals to saturate plant leaves instead of beading up and running off. 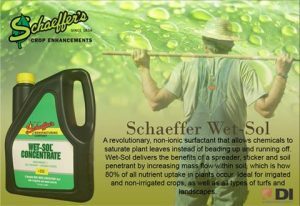 Products such as Schaeffer Wet-Sol also help increase nutrient uptake in soil by increasing mass flow. Soil becomes hydrophobic and water repelling when organic coatings from decomposing matter such as roots and shoots build up on soil particles, causing water to repel from its surface. Such water run-off in the top inch of the soil profile can leave behind localized dry spots and result in the uneven penetration of water throughout the soil. Soil surfactants act as a bridge between the organic coatings and water to help aid in its penetration and retention, allowing for a more even distribution of water and nutrients. Variations in plant species such as wax content and composition, leaf arrangement and architecture, and plant hairs, are among the various features that can affect the overall performance of surfactants. To optimize the performance benefits of these specialized additives, surfactant solubility should complement the solubility characteristics of the selected pesticide. In other words, both the surfactant and pesticide should be oil-soluble or water-soluble. Additionally, environmental conditions should not be overlooked, as plant cuticles are generally thicker and harder to penetrate under low humidity conditions while thin, relatively permeable cuticles are favored by high humidity and high moisture conditions. Without a doubt, the science of surfactant technology has increased the effectiveness of pesticides. However, caution must be taken to ensure that the proper surfactants are selected, as damage to plants can occur when not utilized properly. Be sure to read labels carefully. When applied at too high a rate, there is an increased risk of toxicity to the plant’s leaves and roots as well as potential membrane permeability damage. When used as directed, however, non-ionic surfactants provide a safe, stable and highly effective solution for farmers seeking to meet the nutritional demands of an ever-growing population. Stick With It! Choosing The Adhesive Or Sealant That Is Right For You. When it comes to choosing an adhesive or sealant for your specific application, the task can seem overwhelming with so many different products on the market today. Although the two terms are sometimes used interchangeably, there are some critical differences that should be noted before making your selection. In this article, we will discuss the specific properties of both and their unique applications to confidently equip you with the information you need to grant your “seal of approval” and stick with it! Sealants are designed to eliminate gaps between surfaces and prevent things like dust or dirt from getting in. Due to the tight molecular structure of sealants, they are particularly effective in keeping moisture in or out of the components in which they are used. With a paste-like consistency that allows filling of gaps between substrates and minimal shrinkage after application, sealants contain fast-drying resins and epoxies that form a slick finish. Despite not having great strength, they provide thermal and acoustical insulation and may serve as fire barriers. Also used for smoothing or filleting, sealants are generally malleable and have high elongation when compared to adhesives. Commonly applied with a caulking gun or specialized applicator, multi-component sealants are composed of a base and applicator component. The activator is typically added to the base component and mixed for a set period of time before application. Single-component sealants, on the other hand, are commonly packaged in a cartridge and require no mixing or special equipment for application. Sealants are often used in joints between individual stone or metal panels, between stone panels and flashing, at expansion and coping joints in masonry, around window and door openings, and in joints at horizontal surfaces. The most common types of joint sealants include acrylics, silicones, polyurethanes, polysulfides, latex and butyls. Acrylics – Frequently used in residential and light commercial construction; suitable for both interior and exterior applications such as windows, doors, woodwork trim, walls, ceilings and electrical switch plates. Advantages: Paintable. Disadvantages: Exhibit a short open-time and can be difficult to cure or tool. Tend to shrink and distort over time. Not recommended to guard against water penetration. Silicones – Used in protective glazing systems and insulating glass units to improve thermal performance (minimize heat loss). Advantages: Excellent UV and heat stability, as well as low temperature resistance and high joint movement capabilities. Remains strong and flexible without peeling, cracking or distorting. Maintains a waterproof barrier, making it a good choice for showers, bathtubs, sinks and toilets or outdoor wet-weather conditions. Disadvantages: May stain some types of natural stone without primers and cannot be painted. Can take a considerable amount of time to fully cure. Polyurethanes – Typically used in industrial and commercial applications such as decking and flooring. Advantages: Paintable and bonds well without a primer to a variety of surfaces including masonry, wood and metals. Flexible and may be formulated for good UV, corrosion, chemical and water resistance. Seals and mends fiberglass extremely well. Disadvantages: Cannot be used in structural glass assemblies. Polysulfides – High performance sealants designed for joints that need to withstand prolonged immersion in liquids. Particularly useful in swimming pools, fountains, fuel and chemical storage tanks, or other locations where submersion must be tolerated. Advantages: Water and chemical resistant. Disadvantages: Requires a primer on almost all substrates and poor recovery limits their use in joints with high cyclic movements. Latex – Mainly used in residential and light commercial construction applications; best suited for interior finish applications. Advantages: Excellent paintability with latex paint. Water-based, easy to apply, cleanup and tool. Disadvantages: Should not be used for applications undergoing significant cyclic movement or for high-profile structures. Butyls – Excellent for outdoor applications and well-suited for applying on concrete, brick and stone. Effective on chimneys, gutters, flashing and aluminum siding. Sometimes used in curtain wall applications where adhesion to rubber compounds is needed. Advantages: Exceptional weathering properties, adhesion to most substrates and water vapor transmission resistance. Disadvantages: Stringy and difficult to apply. May not be suitable for UV exposure and limited movement capabilities. May harden and crack over time on exposed surfaces. Adhesives are designed to permanently bind one surface to another, serving as a sort of “industrial glue” for a variety of applications. Although adhesives are more rigid, durable and powerful than sealants, they can be nearly impossible to remove. Generally comprised of more complex structures engineered to grip and bind on a cellular level, they require a better adhesion to surfaces in order for them to hold properly. Consequently, the surface must be thoroughly cleaned and/or specially treated to ensure a secure and long-lasting bond. Available in spray and paint formulas, adhesives will not always dry properly when used on an exterior surface. PVA (White/Yellow Glues) – For use on porous materials such as wood and paper. Advantages: Boasts a long open time and reversible bond with applied heat or moisture. Water-based and easy to cleanup. Dries clear. Disadvantages: Curing time can take up to 24 hours and items being bonded must be clamped together or weighed down for a minimum of 30 minutes. Not recommended for outdoor use since standard PVA adhesives are not water-resistant. Solvent Cements – Used to join PVC pipes, polystyrene and acrylic plastics. Advantages: Quick set and cure time with a very strong bond. Disadvantages: Will dissolve or distort thin materials and is generally not reversible. Solvent cement must be used and stored away from volatile or combustible products, heaters, pilot lights, open flames and other sources of heat. This product can explode and start a fire if it is used in the vicinity of combustible substances. Epoxies – Bonds to most substrates including metal, plastic, glass, ceramic, wood and many types of rubber. Advantages: Extremely strong and highly durable. Resistant to chemicals and able to resist creep under sustained loads. Various curing systems are available for specific applications. Disadvantages: Nonreversible and must be clamped while setting. Cyanoacrylates (“Super Glues”) – Bonds well to a wide variety of substrates, especially plastics. Advantages: Exceptionally strong bond. Cures instantly on contact with mated surfaces. Disadvantages: Poor shock or impact resistance (brittleness) and poor gap filling abilities. Contact Adhesives – Bonds heterogeneous materials such as wood and plastic or metal and plastic. Advantages: Adheres to almost anything, even non-porous materials. Offers instant joint strength development and flexible bonds due to elastomeric base polymer. Disadvantages: Immediate set does not allow for repositioning. Polyurethanes – Bonds both porous and nonporous materials such as wood, metal, rubber, leather, tile, glass, concrete, brick and many plastics. Advantages: Waterproof; Will set well in a wide range of temperatures and high moisture conditions. Requires no mixing, does not contain solvents and can be sanded, stained or painted. Disadvantages: Not as strong as epoxy, setting times can vary considerably and polyurethanes must be handled very carefully. 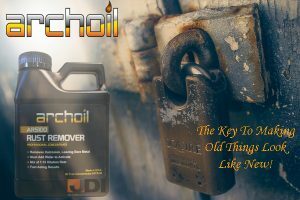 Archoil 5100 Rust Remover Concentrate: Making Old Things Look Like New! Metal antiques, not unlike people, tend to get a bit rusty with age. Aside from the aesthetic repercussions of the aging process, rust, when left unchecked, will eventually eat away at metal. Such degradation results in an overall loss of value and quality, eventually destroying the item beyond repair. Rust, simply put, is the direct outcome of the mixing of iron, oxygen and water from the air. When iron and oxygen combine, the iron loses electrons to oxygen atoms. This transaction is referred to as oxidation and results in the production of a chemical reaction that forms Fe203 Iron Oxide, more commonly known as rust. Consequently, antiques that are left outside or exposed to high humidity levels and/or heavy water exposure are at particular risk for the formation of this by-product. Until recently, rust removal necessitated the use of harsh chemical solvents that, while effective at removing rust, often compromised the integrity of paint on precious metals, as well as the health and safety of its users. However, thanks to the innovative advancements of companies such as Archoil, aging gracefully has never been so easy or so effective. Archoil 5100 works through a process called chelation in which a large synthetic molecule forms a strong bond with metal oxides (rust), but not with the host metal, pulling rust from both ferrous and non-ferrous metals without harming paint. Fast-acting, non-acidic and non-toxic, Archoil Rust Remover Concentrate can operate in temperatures spanning from 65-160 degrees Fahrenheit, but it is worthwhile noting that increases in temperature also decrease the amount of time needed to remove oxidation, especially on heavily rusted metals. To use, simply dilute 1 part AR5100 in 16 parts water and immerse item in the diluted solution, allowing it to soak until all of the oxidation has been removed. Unlike other products on the market today, AR5100 will not form a patina or convert the rust to a new material. With Archoil 5100 Rust Remover Concentrate making old things look like new has never been easier! Animal identification serves as the foundation for maintaining accurate production records of herds and flocks, tracking animal growth, managing treatment records and movement, as well as providing proof of ownership to individuals. Perhaps even more valuable, though, is the critical role a successful identification system plays in global trade, endangered species tracking, emergency management, food safety and disease eradication. In the case of a disease outbreak, the ability to identify farm animals provides farmers and veterinarians with a means to track those animals that are sold or transported to other farms or processing facilities. Such traceability plays a crucial part in helping secure the safety of our food supply, as it provides a way to determine each animal’s unique path and helps pinpoint livestock that may have been exposed to a disease through direct contact with an infected animal. Because some animal diseases also have human health implications, it is essential to properly identify animals to help prevent and eradicate diseases. Throughout this article we will take a look at both permanent and temporary methods of livestock identification, providing you with the information necessary to help educate and guide your decisions when it comes to the long-term care of your livestock and you. Tattooing: This form of identification utilizes tattoo pliers to imprint an number/letter combination into the skin of the animal using indelible ink. The unique identification combo is commonly placed on the ears or lips of the animal and is commonly used on cattle, sheep and swine. Ear Notching: Used widely throughout the swine industry, ear notching involves removing v-shaped portions of the pig’s ear that correspond to a specific litter number and also an individual pig number from that litter. In this system, notches are equal to numbers with the right ear equaling the litter number and the left ear corresponding to the individual number. Microchips: The latest technology in animal identification, microchips are used primarily in the U.S. for high value animals and pets. This process involves implanting an electronic chip with a miniature radio transponder and antenna under the skin of the animal. Freeze Branding: Freeze branding involves the use of branding irons, with letters and numbers, being chilled in liquid nitrogen or dry ice and alcohol. Once applied to an animal’s hide, the chilled branding iron kills the cells that produce color pigment in the hair follicles, but does not kill the growth follicles. Consequently, white or colorless follicles are produced in the branded region, which results in a permanent identification brand. Freeze branding allows for identification from a greater distance than ear tags, but is predominately used on dark haired cattle and horses. Nose Printing: Similar to finger printing, the lines and dotted pattern from a nose print are specific for each animal and can be recorded by making an ink print. Nose printing is permanent and cannot be modified in any way. 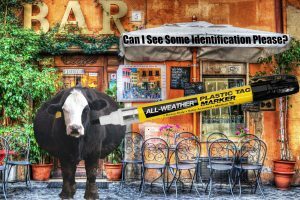 Ear Tags: An economically friendly option, plastic ear tags can be attached to the ear of the animal using special pliers to pierce the skin. Ear tags can be purchased already numbered, or, if purchased blank, may be numbered accordingly using ear tag markers. Such tags are sold in a variety of colors and sizes and allow for front and back identification, when numbered on both sides. Care must be taken to assure that tags remain in place, as they they can fall out or be torn out easily. Paint Markers: Safe for both people and animals, PaintStik Markers are designed to temporarily mark a variety of livestock hogs, sheep, dairy and beef cattle. Ideal for jobs like sorting, inoculating, tail chalking for heat detection, sow breeding and animal health management, Solid Paint Livestock Markers resist weather and fading for long-lasting identification and will mark on wet or dry animals. Neck Chains: Most commonly used with dairy cattle, neck chains have a numbered tag that corresponds to that animal’s identification number. Electronic Collar: Similar to neck chains, Electronic collars have an attached tag with an electronic number that can be read by a scanner. Relatively easy to use, but can cause choking if not adjusted properly to the growth of the animal. Paint Branding: Irons, similar to to those used in freeze branding, can be used to print a number on the animal’s back using paint. Although there is not a “one-size-fits-all” solution for every situation, the importance of selecting an identification method that suits the needs and expected uses of your animal can not be disputed. When used in the correct manner, and under the appropriate conditions, each method will go a long way in supporting the rapid traceability of animals in an emergency response situation while also preserving product integrity and allowing producers to maintain accurate management records. The use of nanotechnology in today’s manufacturing realm has resulted in the production of improved materials and new products that are better built, longer lasting, cleaner, safer and smarter products for the home and a multitude of industries. Although many manufacturers boast the the utilization of this technology in the research and development of their products, few purchasers understand the science and application of such innovation. Nanotechnology involves the study and manipulation of extremely small particles of matter, namely individual atoms and molecules that cannot be seen with the naked eye or even with the most common microscopes. How different atoms are arranged in something can affect the various properties of that item such as it’s strength, texture, durability or odor. Scientists who study nanotechnology alter the structures of materials at extremely small scales to achieve specific and new emergent properties. This is accomplished by putting atoms together in ways we have never done before, creating materials that are stronger, lighter, more durable, water-repellent, anti-reflective, self-cleaning, ultraviolet or infrared-resistant, anti-fog, antimicrobial, scratch-resistant or electrically conducive, among other things. The challenge with such an endeavor is that atoms are incredibly small and consequently, difficult to work with. In fact, the radius of a typical atom is one tenth of a billionth of a meter. To put this in perspective, a string of atoms one meter long would contain an atom for every person in the world. Fortunately, over the past few decades, scientists and engineers have become increasingly skilled at engineering materials down to individual atoms or groups of atoms. Many everyday commercial products that are now on the market rely on nanoscale materials and processes including fabric, sporting goods, automobile parts, luggage, batteries, food, electronics, medicine and fuel and it is estimated that the global nanotechnology market will reach $90.5 billion by 2021. The study and utilization of nanotechnology is paving the way for new innovations that may benefit society in ways that we have not even begun to imagine. To date, nanotechnology is already broadening the medical tools, knowledge and therapies currently available to doctors, which may lead to the earlier detection and treatment of cancer and other medical conditions. Nanotechnology researchers are currently working on a number of different therapeutics where a nanoparticle can encapsulate or otherwise help to deliver medication directly to cancer cells and minimize the risk of damage to healthy tissue, as well exploring ways that nanotechnology can improve vaccines, including vaccine delivery without the use of needles. Nanotechnology also offers future transportation benefits, environmental remediation, and a multitude of electronic and energy applications. Many scientists are investigating new ways to develop clean, affordable and renewable energy sources, along with means to reduce energy consumption and lessen toxicity burdens on the environment. Energy innovations such as more efficient solar panels, stronger and lighter weight wind turbines, lighter car parts and improved fuel efficiency will likely be the face of a future shaped by nanotechnology. 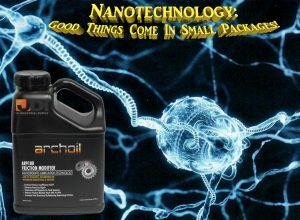 At the forefront of industry attempts to revolutionize transportation and energy outcomes through the use of nanotechnology is Archoil , a leading supplier of progressive, high performance lubrication and fuel treatment products. Changes in diesel equipment design such as the introduction of post-combustion particulate filtration systems (DPF) and hydraulic-electric fuel injection systems (HEUI), as well as the introduction of biofuel and ultra low sulfur diesel blends, mandate progressive solutions to overcome new types of problems. By utilizing specific elements such as potassium borate, hexagonal boron nitrate and tungsten disulfid to decrease friction and corrosion while improving high load carrying capabilities, Archoil has engineered a range of formulations to address lubrication and fuel-related challenges present in modern diesel vehicles. Among these developments is Archoil’s AR9100 a nanoborate-based oil additive that forms a solid boundary lubricating film to reduce friction and provide anti-wear, extreme pressure and anti-corrosion protection to engines, gearboxes and hydraulic systems. This friction modifier improves lubricity by filling surface asperities creating a smooth, low friction, surface. Nanoborate has a lower shear strength than the metal it bonds to so friction between surfaces is reduced. This means less engine noise, better fuel economy and less heat from friction, while also improving power and efficiency. Better for the environment, your engine and you! Having trouble getting revved up about the encroaching winter season? Chances are your heavy equipment is too! 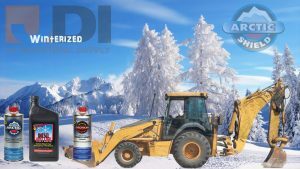 The harsh effects of dipping temperatures, heavy snow fall, cold wind and freezing conditions during the winter can be problematic for people and heavy equipment alike. No need to fret, however, over what mother nature has in store. Preparing your equipment for the elements is as easy as putting on your hat and boots. Just follow these simple steps to put some spring back in your engine and have Jack Frost singing the blues! Diesel fuels are comprised of paraffin wax that serves as a natural lubricity agent. As the ambient temperature of fuel drops, the wax begins to form large square-shaped structures. These structures can cause fuel to gel, clogging your fuel lines and filter. To protect against gelling, use a cold-flow improver (CFI) or a diesel fuel specially formulated for low temperatures. CFIs include de-icers and wax settling agents which extend the operability of the fuel. When utilized at the recommended treatment ratio, winter fuel treatments, such as Schaeffer Diesel Treat 2000, supports improved fuel economy benefits, faster warm-up, reduced emissions, rust protection and improved cetane ratings. A cetane number (CN) is an indicator of the combusion speed of diesel fuel and compression needed for ignition. As a general rule, the higher the cetane number, the faster the fuel will ignite and the more completely it will burn. These attributes are important because as the fuel burns faster and more completely, the engine experiences faster cold weather start-up, increased performance and lower emissions which can be harmful to the environment. Typically, diesel engines operate well with a CN from 40 to 55 during the winter season. If temperatures drop between -4 degrees and -20 degrees, upgrade from a minimum fuel rating of 40 to a 50 cetane rating. Whenever possible, keep extra fuel filters on hand and be sure to empty your fuel water tap before temperatures take a dive. Although fuel gelling can be an issue, it’s freezing water in fuel storage tanks and filtration that typically plugs filters during the early winter months. Replacing water-absorbing filters and draining the water separator regularly can go a long way in helping to avoid damage to engine components such as fuel pumps and injectors. The battery is arguably the pulse of your engine. Therefore, it is imperative that you care for yours by cleaning the battery terminals and making sure that connections are tight. Conduct a visual inspection of your battery, checking for signs of corrosion, dirt or moisture, as these will drain the battery’s life. As temperatures decline so will your battery’s power. At 32 degrees Fahrenheit, a fully charged battery only has a 65 percent cranking capacity. Your engine’s starting requirements, on the other hand, increase from 100 percent to 155 percent. Therefore, be sure to recharge your battery when its capacity drops below 75 percent. When not in use for an extended period of time, batteries should be removed and stored inside. Preventative maintenance is key. Be sure to check for radiator leaks, plugged or hardened hoses and cracked belts. Tighten any loose hose clamps and check coolant levels and anti-freeze strength. Coolants (or anti-freeze) protect your engine from freezing while defending components against corrosion. In addition, they play a critical role in sustaining overall engine heat balance by removing heat. Your coolant level should be one inch over the top of the radiator core and free of contaminants. Be sure that the coolant you are using has a freeze point conducive to the type of climate you are facing. While water provides the best heat transfer, glycol is also used in coolants to provide freeze protection. Ideally a 50/50 ratio of coolant to water will keep your engine running. However, in colder climates a 60/30 coolant to water ratio is recommended. Additionally, avoid using hard water or water that possesses a high mineral content. Hardness levels below 300 ppm of chloride and 100 ppm of sulfate are suggested for best results. Check your tires daily during the cold winter months, as cooler temperatures can cause tires to lose air faster than in warmer weather. Tires should be checked for proper tire pressure and wear marks. When inflating, do so in a heated area whenever possible to help improve the tire bead seal. Such measures will ensure the proper functioning of your equipment and help you stay on track all winter long. Haven’t been able to make a clean shot this season? Well, blame it on the gun….really! As it turns out, the problem may not actually be yours, despite what all of your buddies have been telling you. The truth is, a clean rifle is an accurate rifle. 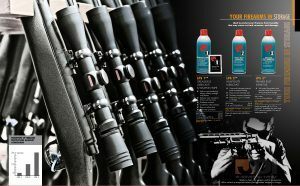 Your firearms require cleaning to blast away carbon, grease, powder residue and oil build-up leaving the firearm clean and ready for lubrication. In order to ensure safe and effective cleaning, begin by emptying the chamber and placing your rifle in a stationary device. Next, use a bronze brush with a solvent to go down the bore, one pass down and back, to break up heavy build-up. A gun cleaning solvent should loosen and/or dissolve carbon and/or metal fouling in the bore so that a patch can wipe it clean. Insert it carefully through the breach, toward the muzzle, and retract it. Now you are ready to patch the bronze brush. Slide it gently into the bore, pushing it through and pulling back until your bore is clean. A patch that is no longer stained with heavy black residue is indicative of a job well done. If you are planning on storing your rifle for awhile after it has been cleaned, consider applying a lubricant to the patch at the end of your brush. Carefully reinsert it into the chamber and bore, push it through and withdraw the brush. This thin coat will help to protect your rifle during the months that you are not using it. Not certain which lubricant to use? LPS 1 Greaseless Lubricant offers short term protection and is safe to use on all parts including bore, buffer tube, pins, springs, trigger components, frame, mag wells, bolt carrier and slide. Additionally, it conditions metal surfaces and reduces wear caused by friction and corrosion. On the other hand, LPS 2 Heavy-Duty Lubricant protects for up to 12 months in storage and will not attract sand, dirt or fouling, so it helps ensure long-lasting, reliable firearm function. Formulated to go on wet and stay wet, LPS 2 coats and lubricates internal parts to prevent binding. Additionally, LPS 3 Premier Rust Inhibitor is an excellent long term storage alternative. It’s soft, waxy film protects and prevents metal from corrosion when stored indoors for up to two years . As a general rule, clean your barrel every ten shots if you require top accuracy. Be sure to lubricate the areas around rotating parts, such as the bolt and trigger assembly. Also, try to keep grease away from the openings into the firing pin housing and don’t forget to oil the bolt rails and grooves in which they ride. Caring for and protecting your parts will go a long way in maintaining the integrity of your rifle and your reputation!